Super Eagles skipper, Joseph Yobo has eventually conceded to the superior power of the Big Boss, Stephen Keshi by admitting in this interview that the head coach has the final decision in the senior national team. First things first, the Super Eagles have qualified for the World Cup. How does that make you feel? It’s a good feeling. The World Cup is something special. I think the World Cup for every player is extra motivation and I remember in 2006 we missed out. Every qualification hasn’t been easy so we have to give credit to the players, and to the coaches. Did you get a chance to see any of the games? I have to be honest, I didn’t see the games because where I am it was kind of difficult to watch the games at the time they were playing. But I followed the scores online and I was excited that they qualified and I want to say congratulations to the team and congratulations to Nigerians. You have played against Ethiopia before. Did you expect them to be that difficult? Yeah, I was a little bit worried especially for the first leg because away games are never easy. But I knew with the team we had, we were always going to get a good result. After we won 2-1, I was more relaxed because I knew we only needed a draw at home and it was going to be difficult for them to beat us and the players stepped up to the occasion. But I think the first leg was very decisive. Did you speak to any of the players before or after the game? Yeah, I spoke with Emenike. And a couple of days ago, I was on the phone with Vincent Enyeama and we spoke for a long time. I haven’t been able to reach out to everybody, but I hope to do so as soon as I can. Yeah, we’ve spoken a couple of times, but we haven’t really talked at length. But he’s the boss, and he has always said that I’m the captain. He says I’m still in his plans so that’s great news as well. For the World Cup and other things, I don’t know what’s going to happen. He’s the boss and he will make his decision. But yeah, we have spoken and as far as I am concerned, there are no issues anymore right now. I don’t know what’s going to happen regarding the World Cup. But from my side there are no issues, I have said what I have to say and that is behind me. The rest is up to the coach. He is the boss, and he decides who he wants to call up to the squad. And what were those issues? Like I said, we have spoken and there’s no point bringing it up again. It’s a private matter between us and there’s nothing for anybody to gain by bringing it up right now. Ok then, what will it mean for you to play at the World Cup? I think the World Cup is always something special. It’s always a big occasion and I think for every player, you want to play at the World Cup, you want to play in the Champions League, for those that are very ambitious because it’s very significant. I’m no different from any top football player. I think the bigger the occasion, the better for me. You’ve played at two previous tournaments. What does it take to perform well at the World Cup? It takes a whole lot. It’s not just about 11 players, its about the whole squad because anything can happen. All the players have to be in shape and be in form.Preparation is the key and every player has to be at their best. So the team will need everyone to be at their best. Do you think the team as it is can do well at the world cup? Yes, I believe in this team, that they can do well. But the team is improving and getting better and better. Credit and congratulations to everybody. But the World Cup is a different level. The coach has been there and done that as a player and has that experience, but it is a different level that requires so much preparation and readiness. Preparation is the key. If we prepare very well with the quality and calibre of players Nigeria has, the team can surprise people. The World Cup is very different from the Nations Cup, it’s very different from friendly matches. I mean, it’s like the Champions League, but at a much higher level. You’re playing against the best players and the best teams in the world so you have to compete at that level. The team already played at the Confederations Cup. Does that help? Yeah. The Confederations Cup is a good tournament. I followed that as well and it was a good experience for the team especially for the inexperienced players coming in. We need more of that. It’s a totally different level from the World Cup, but it was a good preparation. So in the event that you return to the team, what does Joseph Yobo bring? Ha-ha… There’s a lot of experience here. It’s amazing if you look at how far I’ve come, my pedigree and my consistency over the years. Not just my experience. People forget how quick I am.Even now that I have a lot more experience, when I am fit, there are not a lot of players that can go past me. I still feel in great shape, all my qualities are natural and I feel really good, my injuries are behind me.I still have my strength, my consistency, and the same quality over the years and I don’t feel like I’ve lost anything. But also as a captain and a leader, I have more responsibility. To lead by example, and carry everybody through good and bad times.As a player and a leader, I think I understand that, even at my club, I have lot that I give. The important thing for Joseph Yobo is to stay fit. When I am fit, I have a lot that I can offer. Talking about fitness. 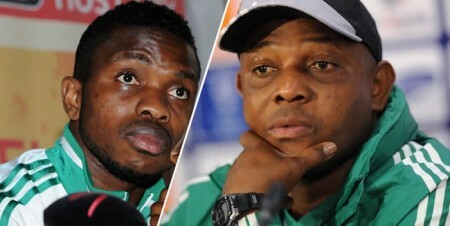 One thing Keshi has said is that he doesn’t want to bring you in and then you’re not happy to sit on the bench. Would you be willing to do that? I am a competitor. That is what has kept me all these years. The day anybody takes competition away from me, then I might as well just retire. I compete at my club every day. This is what I do, this is what I’ve done over the years. Players don’t have a guaranteed position. You have to compete in training every day and show that you are worth the place. Even when people thought I was indispensable in the national team, a sure starter, any of the coaches can tell you how hard I worked every single day in training. I feel like I’m competing with myself, I always have to prove myself over and over again. The coach also believes in me and that’s why he says I’m still his captain. He knows me very well that if I’m fit I have a lot to offer. So all I pray is to stay fit. If I go somewhere to a club and I’m not playing, I’m on the move to the next place. Because I like to compete. If I give my best but somebody does better than me, then that is different. I can accept that somebody is better than me. I’m a fighter, I always want to fight, but if I do that, and I don’t get my fair chance, then I’m on the move. In football, there is no guarantee that this is your position. I’ve played for several clubs. You compete and show that you are the best, and that is how you get in the team. This season at Fenerbahce a new coach came in and everybody had to prove themselves all over again that they deserve to be in the team. I did that and I was playing in the league and the Champions League until I got injured. Competition is part of me. The coach makes the decision on who plays, but as long as that decision is done on merit, and on what we do on the training ground, I’m okay with it. As a player, all you want is for the coach to be straight up with everybody. If a player in your position is better than you are, you will know. If you are competing regularly at your club and playing football at the highest level, then the same thing should apply anywhere else. It’s not a matter of trying to look at someone and say he’s old and carving out a role for him. It should be about competition on the field. We have players elsewhere who have been in the game for long and are still doing it and helping their teams. But for us, we are always quick to say players are old. You’ve been playing for Nigeria since 1999, how have you been able to manage that, especially as almost all of your teammates from that team have long retired? I think I will say it’s God’s work. I’m a strong believer and I’m a hard worker. We are Africans and you understand what I mean. I left Nigeria at a very tender age, just after finishing secondary school. I came up through the youth ranks. When I first came, they didn’t want to take me, but somebody stuck out his neck for me because I was that good, even though I really didn’t show it at the World Youth Championship. I was so young then that I could have played as an under 15 when I played that Under 20. Hahaha Seriously though, I still feel young, I feel like 27. I don’t feel like I have lost any quality that I had before. I just need to stay fit. Another thing is I take very good care of myself. I eat right and watch what I take in. I’m settled, my wife takes very good care of me and my family keeps me grounded. Whatever I need to make me feel good, I go to the extreme to do it, because this is my career, my job. My club provides the very top physiotherapists, nutritionists and fitness coaches and I make sure I use them to my benefit. But in Africa, if somebody has been there for a long time, we say he is old. Instead of looking at somebody who has been doing it consistently. And you are now close to 100 caps. How important a landmark for you will that be? I would love to have it, but it has to be well deserved. On merit. If I’m playing consistently, doing well, I want to be picked on merit I don’t want to be put in the team simply to reach 100 caps. That is not me. I want to get to 100 caps because I am playing football and not because I just want to be there to reach a number, or set a record. I’m a strong believer that everything about the national team should be on merit. Including selection. And that applies to me, too. I only want to get there on merit. But a coach also has a discretionary concession to select a few players if he feels they have something to offer even if they are not performing at their best with their clubs. Maybe an experienced player who has delivered in the past for the national team or a young player who will benefit from the experience. And I think there is nothing wrong in that. So what do you have to do to get in the world cup squad? There has to be competition. I want to give myself the best possible chance. To do that, I have to stay in shape and play regularly. If I don’t get playing time at Fenerbahce, I will go elsewhere to get regular football. And that should be what every player should do. If you want to go to the World Cup, and your club is not playing you, go to where you can play, even if it is a small club. Because if you are not match fit, you cannot give your best at the World Cup. That’s the best thing for you as a player, and for the country that has given you the honour of wearing the shirt. Can Nigeria win the world cup? Haha. Well, we can dream. We are always hopeful. It’s a difficult task but everything is possible in football. And you have to be realistic The way things are going Nigeria is probably going to do better than we have done in the past World Cup which would be a massive step If we can do one better than we have done before, then anything is possible. The most important thing is to take it one step at a time. Let’s hope for a good group, take it one game after the other and focus on qualifying from the group. If we can do that, just like we did at the African Nations Cup, taking one game at a time, anything is possible. It takes me back to 2010 when we went out in the group stage. I thought if we had qualified from the group, we could have gone far.